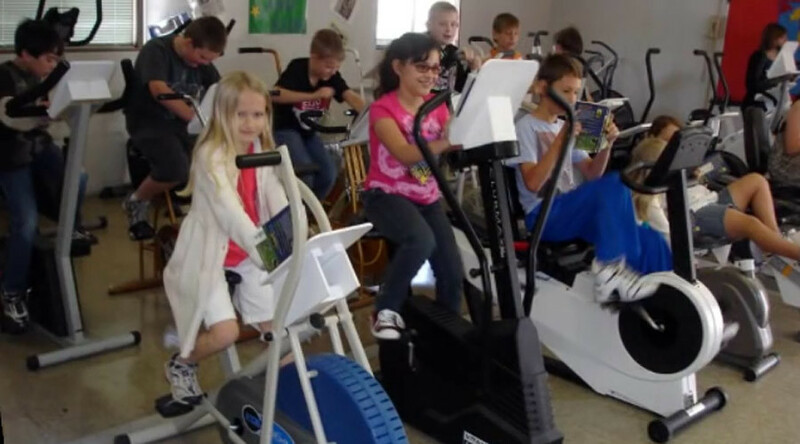 A school in Austria has raised the handlebar for educators by adding exercise bikes to classrooms for students to use while studying. The method, which is being applied at Volksschule Dietrichgasse in Vienna’s Landstraße district, has been proven to benefit reading ability and keep students alert during lethargic school days, according to the local. Some 200 pupils at the elementary school get to use the bikes as part of the Moving while Learning initiative. Every 30 minutes, the students rotate, ensuring they all get time on the bikes. Anyone who remembers long, boring days in school struggling to keep eyes open while a teacher explains the difference between two things you don’t care about might see the benefit of this program. Another said it was fun and “perks you up if you are cycling in the morning”, suggesting it may be a healthier alternative to caffeine addiction. A similar program in the US called Read and Ride combats the country’s growing childhood obesity and stagnant literacy rate with bikes in more than 30 schools. Students who spent more time on the bikes achieved 83 percent proficiency in reading compared to 41 percent for those who spent less time, a study about the US project found. These new techniques for student fitness will also prepare them for the working world where productivity is key.